If there was a thread through two months of Asian pilgrimage, it was the foreign habit of religion. Did I want to pay tribute or to judge that my faith was better than the others? I discovered that we are all looking for the same things, worship one God, and that none of really know what is going to happen after death, but we have challenging theories. I was at the mercy of generous Buddhist most of my trip, and will ever be grateful. There were discouraging moments when I reached out for my faith, and usually found it in surprising places. Only in ex-British India did I even see a church, an Anglican church. At times I felt I was holding a candle in hurricane winds while being blistered by the sun. The Lord’s Prayer was surely my daily mantra. And I never doubted I was in the right place, in God’s place. So I took off my shoes, everywhere. Unlike most Western faiths, displays of worship and prayer are not limited to a one day gathering on Sunday. It integrates every day, is common as boiling water for tea. It is like living beside Fatima or Lourdes full time. Everyone worships all the time in their gestures. Buddhist - and Hindus - rise in the morning with gifts in their hands - be it replenishing bowls of water, bowls of rice, fresh sculpted butter candles, wreaths and strings of marigolds, flowers, and offerings of every sort (including piles of candy bars, crackers, fresh made sweets and snacks). First thing to do is remember Buddha and his associates who can make or break a day. Truly, their highest power is God, but there is not the pandering, proselyting and preaching which can be so artificial or invasive in our lot trying to convince one to accept the Holy Spirit or to commit your life to Jesus - pass the offering plate - that goes on a nd on like a broken record player in America, especially across television screens. In Nepal, India, Bhutan, Old Tibet, you watch and admire how regular are actions of devotees of other faiths, whether it’s circling to the left the chortens and stupas or turning 108 metal prayer wheels installed in walls around important temples or putting red dot blessings on the foreheads of sacred cows, children and pilgrims wandering the streets of the cities. Hindus believe the most powerful offering before God is a flower in the hand. In fact, Buddhism and Hinduism are mostly about giving and seeking peace, going through routines every day that express one’s faith whether anyone else is looking or not and without feeling one deserves credit for doing it. Each Buddhist home, for example, has a puja room or alta r room where special visits by monks and lamas are made once a year to re-clean and re-bless and re-kindle the family spirit and home. In the early part of day before one goes off to work, streets are busy with those making wreathes and decorations from fresh flowers to place before altars whether of Vishnu or Buddha. Every town, burg, pueblo, or community is hung with prayer flags and provide a series of small to large chortens or stupas around which the faithful walk clockwise, often praying long strings of beads, whether on a steep trail or on a paved street. From the moment you leave the airport, there is no doubt you are in a Buddhist town because prayer flags drape bridges, flags flap on roof tops and in the trees are more prayer flags both horizontal and vertical looking like white and gray doves in flight. Temples stand out for their architecture and monasteries are identified by painted gold roofs. There are monks everywhere, shaved heads, cranberry or mustard colored or orange robes, their feet in sandals, their possessions limited to the food given to them each day, ad may be a cell phone. They hold their hands in prayer position and bow for a Namaste when they meet friends. Everyone copies that greeting. In Nepal and Tibet and India, Namaste is a given. In some parts of India the greeting is Jale. In Bhutan, the pose holds, but their greeting is in Bhutanese. In Thailand, everyone who serves bows in a Namaste position when they see you the first time or when you depart. It’s a thank you as well. But there is no particular word to say. Best is to smile, pose your hands in the prayer position, and bow joyously. Lamas, who are approachable and are willing to preform ornate blessing ceremonies for a good trip or good luck, often have homes and families. Because they spend so much of their lives sitting in the Yoga position, they often have serious knee and leg problems and need help when walking to and from Temples. Yet, Buddhism, which is much cleaner and bet ter organized to me than Hinduism, embraces all of East Asia, changing its ambience depending on which country you are in. In Bangkok was the first time Muslim mosques and covered women were noticed. In Nepal, Buddhism is woven into community life, is communal in nature, and is comfortable for even the stranger. You are warmly welcomed or sent off with a neck full of silk kata scarves for good luck and good travel. Blessings abound no matter who you meet. Lamas and priest tie good luck strings around your neck as blessings and sometimes they make prayer packets for protection and those are tied around your neck as well. It’s all so simple and done with vigor and affection no matter who you are. 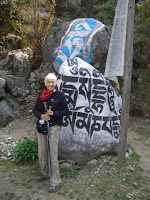 In the Khumbu where I trekked to the Everest base camp, there were endless chortens and stupas and giant boulders painted with the "Om" to be circle clockwise. In the middle of no where, there’d be an archway with a giant metal prayer wheel needing a turn. Even dinning areas were long wooden floors of red block tables painted with Buddhist symbols and protector gods and goddesses. Walls were lined with windows and benches padded with carpets. This is where exhausted trekkers fell for a rest, dumping their gear beside them as they sipped tea from giant thermoses. Walls were hung with copies of religious thangkas (like formula icons.). Sometimes mythological stories were painted directly onto the wall. 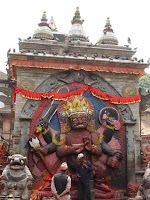 There was so much simplicity and humility in the daily lives of the Nepal faithful, that the ornateness of the puja r ooms and the temples give surprise: golden Buddhas, elaborate yak butter candles made to look like flowers, ancient texts stored in cubicles, all sorts of brocade and silk fabrics hanging from walls and ceilings. 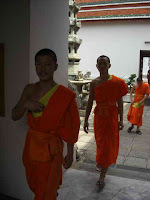 But the monks and lamas invite you in while they chant or eat, often revealing their senses of humor. 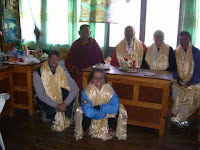 Making offerings, hanging prayer flags, inhaling incense and drinking yak butter tea are as normal as a bow. Of co urse in the big cities, like Bangkok, there is more wealth, more gauche display, more opportunity for pilgrims to chant their prayers before statues of their favorite Buddha forms. 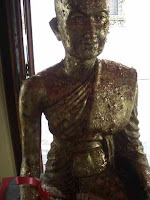 Worshipers can even buy sheets of gold to attach to already gold statues of Buddha. 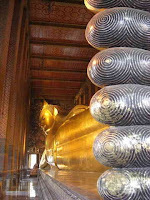 I was overwhelmed by the reclining Buddha, whose feet at one end were larger than a Mac tr uck. The entire long statue was in gold and on the passage way along his back side, 108 pots were lined against a wall. 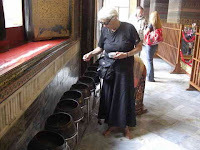 Pilgrims could purchase 108 coins and drop one coin in each pot. I tried, walking reverently, thankin g my own God, slipping one little coin at a time from my fingers. But if I stopped to take a picture or notice something amazing about the huge statue, I lost count and somehow came out with about eight extras which I just dumped in the final pot. I noticed it had more coins than the others, so I wasn’t alone. 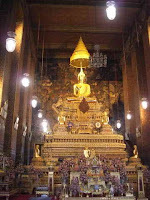 Photos: Sitting Buddha in Bangkok temple (photographs allowed here, but not in other countries.) A worshiper; a Hindu monster smudged; Thai monks; Lama Geshi blesses all of us with many katas; rocks and flags to acknowledge; a puja room; Reclining Buddha from his soles; a Buddha statue pasted with gold leaf offerings; dropping 108 coins in 108 pots.